Last year, Union County, N.J., started a renewable energy project that is installing solar panels on public facilities and saving participants money on their energy bills. The Renewable Energy Program of the Union County Improvement Authority (UCIA) is a public-private partnership between the UCIA, a solar energy developer and 12 public agencies in the county. Under the program, UCIA is providing Tioga Solar Union County 1, a private solar developer, with low-interest bond financing to install 32 solar projects with 12 local government units. The local government participants include five municipalities, six boards of education, the County of Union Vocational – Technical Schools, Union County College and the Morris-Union Jointure Commission. 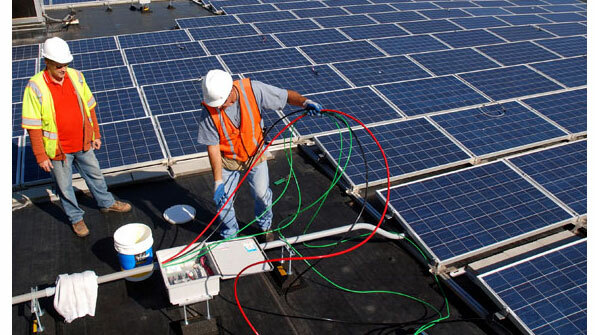 The vendor is installing, maintaining and operating the solar panels, and the public agencies have signed power purchase agreements to pay for the solar electricity they use. The solar energy rates are much lower than the agencies would pay for conventional electricity. When completed, the system will provide 3.4 megawatts of energy throughout the county. Participating agencies expect to reduce their energy costs by 52 percent for a portion of their energy needs. “When our legal counsel, DeCotiis, FitzPatrick & Cole, introduced us to a program that uses power purchase agreements to the county’s financial benefit, we knew it was a way to save precious tax dollars and create a cleaner Union County,” says Charlotte DeFilippo, UCIA executive director. Design, permitting and construction began in May 2011, and all projects will be completed by May 2012. In December, the program completed the installation of solar panels at the Cranford, N.J., Community Center; the Cranford Public Library; the Linden Public Library and the Roselle Park Sherman School. “Power purchase agreements allow local government to purchase cheaper and cleaner energy, and it is truly a win-win for the taxpayer and the environment,” says Union County Freeholder Chairman Alexander Maribella.